Pharma Marketing Blog: Pfizer has a Gold Mine in Sermo! Pfizer has a Gold Mine in Sermo! The recent announcement of the Pfizer-Sermo deal has been discussed by practically every blogger in the Pharma Blogosphere and beyond! Is Pfizer in this to promote its products to Sermo docs? Reading all these blog posts and articles would lead you to believe that that is what's behind the deal. If you look at Cafe Pharma, for example, you will find that some Pfizer sales reps wonder if this signals the "Beginning of the End for Sales Reps."
"Look people," says one rep, "the days of old are gone. Companies will have more and more docs working for them, giving other physicians our message. [Whether] it be through Sermo, conference calls, video playbacks, internet, etc. But the sales rep will always be in existance (sic), just at about 1/2 the numbers we are at now." But will the message appear as through a "darkened mirror" as Paul envisioned our knowledge of God in this life? Or do physicians need face-to-face interaction with reps (or with pharma's hired physician guns) to fully know the benefits of drug treatments offered by pharma? "I am not a fan of PhRMA…and I am especially not thrilled at the idea that they will now have one more way to 'get at' physicians via Sermo." Writes another: "Any influence from Pfizer has to be absolutely marked and labeled loud and clear! I am sick and tired of industry people sneaking in their subtle, hard-to-detect influences into everything and every media corner money can buy.” Another warns: “No Pfizer docs acting like reps in here!" Says one doc: "There is no way Pfizer is interested in anything but marketing in this ‘partnership.'" (see "Docs On Sermo-Pfizer Deal: ‘You Let The Enemy In’"). "But the venue could, conceivably, create myriad scenarios in which, say, off-label info is conveyed or trial results are somehow whispered prematurely or selectively" (see "Pfizer Strikes Deal With Sermo’s Online Doctor Forum"). "However, despite these concerns, we must remember that Sermo has a lot to lose and little to gain if it allows Pfizer’s physicians and marketing department to use the social network in inappropriate ways. Sermo is only as good as its physician community. If it becomes apparent that Sermo has become nothing but a front for drug firms . . . bye bye Sermo (see "As Sermo & Pfizer Link Up, Some Worry About Off-Label Marketing"). The off-label promotion issue is really a red herring. The last thing Pfizer wants is some doc on Sermo reporting that it has engaged in illegal off-label promotion via Sermo posts. Besides, Pfizer would be pretty stupid to do something like that in a medium that records every word written by every poster! No, it's not off-label promotion that Pfizer is interested in. 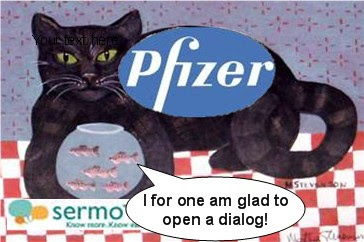 In fact, I do not think Pfizer is interested in promoting its products at all through interaction with Sermo docs. After all, there are only about 30,000 docs on Sermo out of approximately 700,000 total docs in the US! And what does Sermo know about these docs? Only that they are licensed physicians in a particular specialty or general practice. It knows squat about their prescribing behavior. How can you market to docs willy nilly without knowing their scrip writing habits? Or if their scrips increase after marketing to them? So What Does Pfizer Expect to Get Out of This Deal? Pfizer expects to recruit docs to influence other docs, that's what! Which docs on Sermo are our friends? Which ones have the highest ratings among other Sermo docs and therefore are likely to be influential? Which docs seem interested in becoming consultants or doing clinical trials? If Pfizer can identify and communicate specifically with these docs through Sermo, then they may have a gold mine. Sermo itself may not reveal the identity of its physicians to Pfizer, but that isn't necessary for Pfizer to be able to contact specific physicians who allow private messages with other members or include their contact information in their profiles. Having this source of Web 2.0 enabled physician evangelists, Pfizer can then pay them to spread the Pfizer gospel throughout the Net. "Then shall I know fully even as also I was fully known." The Sermo initiative by Pfizer comes as a breath of fresh air in Pharma marketing. I expect Merck to follow, for an online physician oriented campaign in favor of Gardasil.